Before being a chocolatière her great passion was desserts. 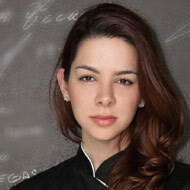 The Colombian, Melissa Coppel, was trained by top professionals in France and Spain and inspired by pastry cooking in restaurants (Blackbird Restaurant in Chicago, and L’Atelier of Joel Robuchon, Las Vegas) and in hotels (Bellagio and Caesar’s Palace, both in Las Vegas). When she opened the chocolaterie with Frenchman Jean-Marie Auboine (Jean-Marie Auboine Chocolates), in Las Vegas, she pledged to champion the imagination and artisanship, and to play with techniques, flavours and compositions from the world of the dessert. In late 2015, Coppel began a new career in Las Vegas, with new projects in hand. It will continue with one of the pastry aspects that he likes best, training. Thus she combines one of his greatest passions, pastry and chocolate classes, with consulting. She runs her own Atelier Melissa Coppel. She has also been named a new ambassador by Cacao Barry USA and is now immersed in projects for this firm. 2006 Trained at The French Pastry School, Chicago.